Step 1 Place the artichokes, olive oil, garlic and 1/2 teaspoon of salt in a 9-inch skillet. Pour the water over. Place over high heat and as soon as the water begins to bubble, tightly cover the skillet. Cook, shaking the pan frequently, until the artichokes are just tender enough to pierce with a sharp knife, about 4 minutes. Step 2 Remove the lid and continue cooking over high heat, stirring constantly, until the water has completely evaporated (the sound will change from bubbling to crackling). Add the mint and lemon juice and stir well so that the glaze completely covers all of the artichoke pieces. Taste and add more salt or lemon juice if necessary. Serve immediately while hot or at room temperature. In Recipes-list.com we have selected the most viewed recipes from category - Appetizers Vegetables Vegetarian . Enjoy the best recipes specially selected for you! 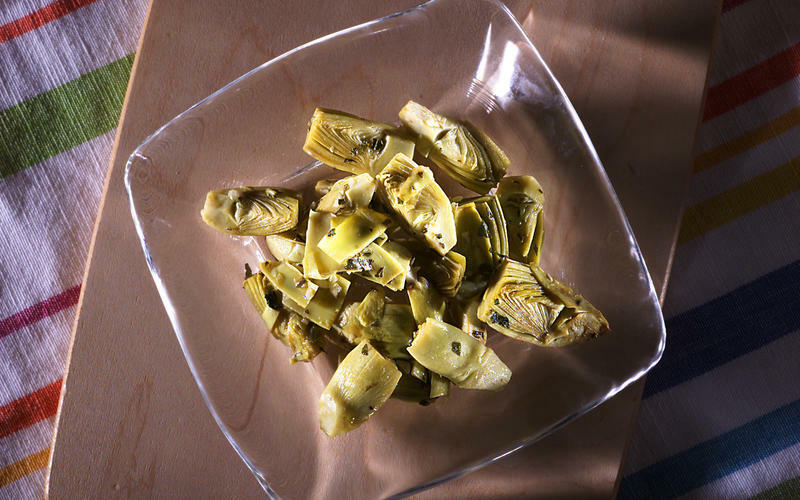 Braised Artichokes With Garlic and Mint is the right choice that will satisfy all your claims.